It’s been 33 years since Simply Red’s debut album Picture Book introduced the world to singer Mick Hucknall’s northern brand of blue-eyed soul. They say the last thing to depart a champion boxer is his knockout punch and if a similar comparison can be made with singers, then it’s the voice. Too many tours, too much hard-living and not enough rest can ravage what was once a thing of beauty. Now, aged 58, Hucknall – who has just released a live performance CD and DVD, backed up by a full orchestra – has cottoned on to the best way of preserving what has been his livelihood for four decades. He tries his best not to speak during the day. Selflessly breaking his own rule, he talks to BBC News. “As I’ve gotten older I’ve got more bass in my voice but also because I don’t talk very much during the day I’ve managed to keep my voice in good condition. Symphonica in Rosso was recorded over three nights at the Ziggo Dome in Amsterdam in 2017. Hucknall and his band are accompanied by a 40-piece orchestra as they run through hits from across their eleven albums and some jazz standards made famous by Frank Sinatra and Nat King Cole. 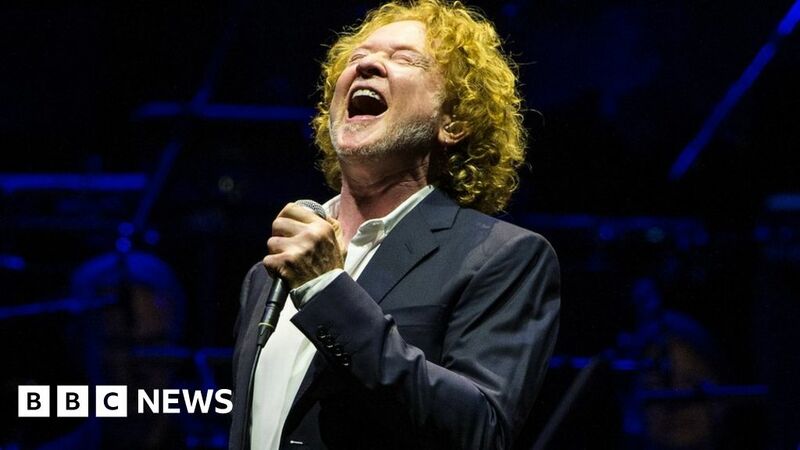 “The initial offer came out of the blue and I replied ‘yes’ immediately because the last time I performed with an orchestra that size was in Greenwich on Millennium night for the BBC,” says Hucknall. “They asked me to perform what I thought was my song of the century and I chose Frank Sinatra’s My Way and I performed it with the London Symphony Orchestra. He admits it’s an intimidating challenge for a singer to try to match the sheer volume of a live orchestra, given he generally doesn’t like to rehearse. “It was very, very different when you perform with an orchestra – when you watch a conductor working, they are moving to a swing they are not responding directly to the beat. “I don’t usually rehearse, which scares my bandmates sometimes but in this case, I thought I’ll turn up and sing a bit and keep everybody happy and I was really glad that I did because it was entirely different. It was back in 2009, two years after Simply Red’s number four album Stay, that Hucknall announced he was bringing Simply Red to an end, 25 years after they formed in Manchester. “I’ve kind of decided that the 25 years is going to be enough, so I intend that the 2009 will be the last Simply Red tour,” he is reported to have said at the time. Six years later, the band reunited for a 30th anniversary tour, out of which bloomed a new top five album Big Love and another anniversary tour the following year, this time for 25 years of their chart topping Stars – the 11th best selling album of all-time in the UK. Hucknall insists people may have misinterpreted his seemingly self-imposed early retirement. Raised by a single father after the family was abandoned by his mother when he was just three years old, Hucknall relished being in a position to be a hands-on dad. “Bringing up my kid was the main reason why I stopped. If you don’t then you’ve got these endless commitments. You get pressure from the record company to release an album every two years, you have to go on tour and I knew that wouldn’t stop, so I said to my manager, ‘I don’t want to do this any more’. According to the latest figures from the office of National Statistics, more than 232,000 men opted out of the workplace in 2018 – that is the lowest number since 2014. And in March this year, an Equalities Select Committee report found only 2% to 8% of fathers take up shared parental leave. To stamp home the point, Hucknall reveals his band have just recorded what will be their 12th studio album, which he says will be a departure from the “smoother sounds” of previous releases. “I wanted to push my voice a little harder,” he explains. Once a mainstay of the heady 90s’ London party circuit, Hucknall credits his new-found domestic bliss with a new burst of creativity. A songwriter he may be but writing his own memoirs apparently holds no interest for the singer whose colourful love life was once the talk of the tabloids. “I’ve never been much of a celebrity,” he claims. “I’ll leave that to other people. My biggest thrills were encounters with great people, being complimented by George Harrison and Miles Davis. Simply Red: Symphonica in Rosso is out now.